Let’s begin by looking at that bastion of mild-mannered, soft-voiced and charmingly polite2 climate denial, Richard Treadgold’s Climate Conversation. In a post titled Expert opinion against exponential sea level rise, Treadgold attempts to debunk fears of rapid sea level rise by bowing to the wisdom of experts. Unfortunately, his “expert” is nothing of the sort, because it is none other than Dr Willem de Lange3. de Lange, regular readers may recall, lists his work for the Heartland Institute’s Not The IPCC report as an academic publication — work that involved plagiarising earlier Heartland propaganda, right down to making the astonishing claim that “the Arctic regions have been cooling for the last half century”. There’s little chance that in only five years since then these probabilities have altered to any meaningful degree. Prof de Lange is among the foremost ocean scientists in New Zealand. Solid evidence is required to contradict his opinion. I’ll look up the IPCC projections for sea level rise in AR5, but I seem to recall it sits at about 450mm by 2100. Unpacking all the untruths in just this one paragraph would be the work of another, longer, article, but the short version is that de Lange was dramatically wrong five years ago, that our understanding of the issue has advanced a great deal in the interim, and that to call de Lange “among the foremost ocean scientists in NZ” is to do a grave disservice to the oceanographic community in this country. Harmless gilding of the lily, or slapping lipstick on a pig? You decide. Just what do we know about current sea level rise, and how it might change in the future? The physical science part of the IPCC’s 5th report is now two years old, and based on papers published up to a year or two earlier than that. A lot of work has been done since, and we are learning a lot — not much of it good news — about the way that the ice sheets of Greenland and Antarctica are responding to current warming. There’s a very good summary of the (very conservative) IPCC report at Real Climate here. Even with deep emissions cuts, a rise of 28-61cm is modelled for the end of the century — with the behaviour of the ice sheets a nasty wildcard in waiting. If we want to know where we’re heading, we can use paleoclimate (climate history) data to help. The last time CO2 was at current levels, 400 ppm, was the Pliocene — a period 4 million years ago when sea level was around 20 metres (plus or minus a few) higher than today. In other words, as long as atmospheric CO2 is at current levels, we can be reasonably certain that we are committing the planet to very substantial long term sea level rise. We just don’t know how long it will take to get there. We could be lucky, and the ice sheets could melt slowly, giving us a few hundreds to thousands of years to adapt. Or we could be unlucky, and see multi-metre sea level rise over the next century. James Hansen’s latest paper is relevant here, because it is the first to attempt to model what would happen in the event of ice sheet collapse in the near future. Hansen et al point to the rapid increases in ice mass loss on Greenland and Antarctica over the last couple of decades to justify their modelling, and suggest that the impact of collapse would be to cool large areas around Antarctica and Greenland, leading to an intensification in extra-tropical storms as cold oceans rub up against rapidly warming tropics. This is controversial stuff, and far from being a consensus view — but Hansen’s co-authors include many senior researchers in relevant areas, so their conclusions can’t be lightly dismissed. The policy relevant question, therefore, and the one that should be exercising the unlucky people who own coastal properties and the councils who administer their services, is not how much sea level rise there is going to be, because we know there is going to be a lot — but how soon it will make seaside life uncomfortable. That involves making some kind of estimate of risk — and that means staying in touch with what’s happening at the poles, not donning rose-tinted spectacles and pretending that nothing will happen. For the people of Christchurch this is very much a live question, as can be seen by the council’s consideration of a mini-Thames Barrier to prevent flooding around the estuary, and on the other end of the spectrum in the efforts to demand that the Tonkin & Taylor report be “peer reviewed”. The bad news is that the T&T report would probably now be judged to be optimistic about future rises. Later this year the Parliamentary Commissioner for the Environment — who reviewed the science of sea levels in a report released last year — will release a second report looking at potential impacts on New Zealand coasts. We can also expect the Ministry for the Environment to release updated guidelines for local authorities on climate change, based on the IPCC’s 5th report. These will feed into local authority planning around the country, and set the scene for what promises to be a series of local battles as those with coastal properties seek to limit their long term (inevitable) losses. There will be a temptation for coastal landowners to choose their climate information from those who would tell them there is no real problem. The bland science and physics denial that infests the pages of Treadgold’s climate echo chamber might be reassuring for the ill-informed, but if they follow the inexpert advice of the likes of Willem de Lange they will end up paying a steep price. 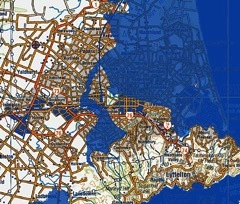 In Christchurch, the city council and the planners committed to rebuilding the quake-damaged city need to face up to the long term problem of sea level rise. It may not do much harm — or cost much money — to allow people to continue to live in coastal hazard zones, as long as there is no new major development or the construction of infrastructure with a likely service life of more than a few decades. But they also need to think about the location of the city itself. Rebuilding the central city at its current location could turn out to be extremely shortsighted. Thanks for this blog, Bob. On Waiheke Island, where coastal properties are at a premium, this conversation has not even begun. And Council continues to issue building permits for properties ridiculously close to the ocean. At some point there will be a very painful awakening. Bob, check your data of the ALK airport. The touchdown zone on RWY 05 (coming in over the harbour) is at 15ft or 4.5m and at RWY 23 (coming in from Manukau) is at 23ft or 7m. I would thus hope to think that the airport is safe for another century or more, longer than age of flying from the Wright Bros to now. Storm surges might have a growing affect but they are still events that recede. But of cause if Hansen’s worst predictions should come to pass, things will look very different. The airport will then probably one of our least problems to deal with as planes could use an extended Hamilton airport or Whenuapai for example. Flying as such will need a significant overhaul obviously if we want to move away from carbon based aviation fuels. Perhaps NH3 fuels will be the future. It still surprises me that folk still think of SLR in the context of AK airport or ChCh eastern suburbs, forgetting that it will hit all of our coast simultaneously. Ports, cities, SH1 & Main trunk railway etc etc. At a time when flooding insurance will be unobtainable. The reason that the Christchurch district plan is focused on the eastern suburbs is because the government want to get rid of them, and their residents, to avoid or limit their liabilities due to Earthquake damage. “Climate change” provides a useful hammer to hit the people with. This is the view of people here, anyway. Wonderful conspiracist ideation on display there, Andy. You’ve clearly been spending too much time listening to the wrong sort of “climate conversations”. Of cause, denial and conspiracy theories are a well known defense mechanism for people under stress….. The tough edge of climate change is showing its relentless advance. It is time we start to get used to the fallout and learn to deal with it. of course people are stressed out about 1.7mm of sea level rise per year. It has nothing to do with 10,000 earthquakes, and years of battling EQC and insurance companies. They are in denial, all of them. Sometimes people try to engage with me as if I were looking for honest dialogue. Well, they’re idiots. There’s nothing honest about me, so good luck trying to have a debate with me. I believe I’m engaged in a war against climate terrorists who are looking to destroy our way of life. We have three regular deniers via the ODT. Dr. Jock Allison, Peter Foster Bsc and Calvin Oaten. The first two obviously know the facts but out of solidarity toward the farming lobby will not admit there’s a problem and if there is it is not anthropogenic. This takes methane out of the discussion (they hope). The other chap who is a bit of a number whizz, looks for mathematical discrepancies. All focus on minutiae whilest the beaches erode, the seas advance, the glaciers retreat and our climate creeps toward draught and flood. Their current focus following obediently on from Wattsupwithat and Jonova is the missing stratospheric hot spot (no longer missing) and the water vapour mysteriously increasing by “God knows what”. Poorly maintained tide guages in NZ ports affords opportunities as well. Clearly who-ever proposed a barrage hasn’t actually thought about what they are suggesting. ANY sort of barrier across the mouth of the estuary would encourage the sea water to pass under or through the fragile South Shore spit. I was surprised when an engineer discussing SLR glibly proposed that if need be, they would build a barrier from Scarborough to Waipara, with extensions up the rivers as required. He looked stunned when I pointed out the porosity of alluvial gravels and the likelihood of some spectacular salt-water springs appearing inland of said dyke. Plus such a solution would be required at a time when every coastal community and city would be struggling with their own similar problems. It would appear that our political leaders are hoping for the best and planning for the best. If I owned a property anywhere east of the CBD I’d be quietly relocating before even the deniers start wondering why their feet are wet. Up here (Waipara), I regularly cycle along what I take to be an Eemian beach – where the sea would have been during the high stand (+3-6m) of the last interglacial. It’s a pretty substantial terrace (Hursley Terrace, in fact) that runs from Leithfield to the north, parallel to and about a kilometre inland of Amberley Beach. Down at the beach, the road to the golf course is getting washed out with every storm as waves eat away at the shingle bank it’s built on. Along the shore, there are some nice exposed tree root systems. I get to see ocean incursion every time we take the truffle hound for a walk there. My guess is that 4-6m of sea level rise is already “baked in”, and we need to be aggressively reducing atmospheric carbon ASAP in order to avoid much more. I wouldn’t be building anything much more complex than beach huts on the coast. Goodness, I had a walk over to the “dark side“. Perhaps the man can get away with pleading insanity. But then again he stills owes us for his lost quixotic law case. Perhaps “insanity” would be too cheap a solution for the man…. Don’t you sometimes cringe at the complete nonsense you subscribe to and fabricate yourself over there? Andy, sorry, you said that ‘the relationship between “global surface warming” and SLR seems to be weak’. And I am sorry, but cringing and whinging will not help those owning affected properties. What will slowly happen is that insurers and banks will not want to be sitting on or insuring assets that have a use by date unlike real estate on higher ground. It is only fair that potential buyers should be notified of that fact. It is also fair I would think that society does not want to collectively pay for (that is what insurance is doing) those who wish to cash out by means of a tax on the rest of us when the water taketh away their assets. Society might decide to build defenses to hold back the inevitable for a few decades longer…. but the smart money is on moving to higher ground I would think. And the laughable tosh you guys slosh about at Climate Conservation is certainly not going to do a “Moses” for you…. But obviously ocean heat energy comes from the surface warming of the planet. Sea level rise is being driven by global warming one way or the other, either through thermal expansion or melting ice. There is a change in rate of sea level rise since about the 1970s. Have a look at the links in Thomas’s post. There is also a steeper trend since 2010. It will be interesting to see how that develops. The Tonkin and Taylor report looks rather conservative, in light of more recent evidence on sea level rise. Regarding building in low lying areas. In my opinion if people want to add a room to a house that should be their affair. Mitigation / adaptation rules have to be practical. However it doesn’t make much sense building new subdivisions in susceptible areas. As a member of the NZ Climate Science Coalition, I am frequently privy to learned conversations. As you can see,, the V2 report is much more detailed on the geotech side. Thanks Andy. I’ll update the post to take that into account. Regardless of the outcome of the political or engineering processes, those with most money to loose from foolish investments on land that soon will be sea will determine what happens. The insurance actuaries are quietly doing their sums. First they will ramp up the rates if there is a risk which contains at least some chance of the bad thing not happening (not every house burns down – so Fire Insurance works for them). But where the risk becomes a certainty (and enough sea level rise to drown Christchurch and every other property within 75 metres of present day sea level is a certainty) then they will simply refuse to take that risk at any cost. No insurance, thus no finance,thus no building, and the land lies fallow awaiting its inevitable fate as beach and eventually as seabed. I understand that it is illegal to issue a building permit for a development which cannot prove a viable 50-year life. Year 2065 – I would imagine that the high tide mark for that year will tidy up quite a few properties around the nation. And of course critical infrastructure like sewage treatment and disposal plants will be drowned very early on, then salt water intrusion into water supply wells adds another minor complication. These issues could make large parts of the city uninhabitable long before denialists sitting glued to their silly little screens watching the latest edition of NZ Had Talent notice that the surf is swirling around the legs of the dining room table. Building barriers is, of course, a nonsense. The scale of the civil engineering works is far beyond the economic or construction resources available; the barrier will have to be continually raised at exponentially increased cost for each increment, while the land ‘protected’ by the barrier becomes ever more susceptible to catastrophic failure. We simply cannot afford it. Better to retreat gracefully and spend resources on adapting to the inevitable rather than pursuing futile Canutist quick-fixes which solve nothing and fool nobody. I understand that it is illegal to issue a building permit for a development which cannot prove a viable 50-year life. There are many new houses being built on Marine Parade in Christchurch, and also on the Southshore Spit. I imagine that the rebuild is an obligation of the ‘contract’ twix the insured and the insurer. The insurer cannot avoid the payout including conditions in the insurance agreement that provide for a rebuild. It will THEN be very interesting to see if that same insurer, or any other insurer are prepared to take on the risk of continued cover for those properties. Those are questions the present owner will need to consider come policy renewal time, and any prospective owner will need to consider if (for some unimaginable reason) they want to buy such a property. In many ways, the central basins are more vulnerable than the coastal zones, since the water has nowhere to go when you combine a high tide with heavy rainfall in an area that is a natural pool. However, it is only the coastal zones that have building restrictions put on them. Here’s another angle to coastal living with climate change. Which is another good reason, in addition to accelerating SLR, that Andy sold up in South Brighton and moved inland. Just another example of “Do as I Say, not as I Do”, Andy? No, Andy, you were, in your own words up-post, just “managing your own risks” by moving well away from the coast. I suspect that your new home is not on a flood-plain, nor in the middle of a pine forest, either. You may be a professional AGW denier, Andy, but you are not a fool, and you know full well what is coming. I dont think he is a professional AGW denier – no evidence of professional standards and who would pay for this. Perhaps also not a fool, but most certainly a twit. I didn’t say I was managing my own risks, if you care to read what I actually said. Andy, your actual words were “people need to be able to manage their own risks”. Which, you are clearly doing, clever chap that you are, by quitting your South Brighton property to move inland and upwards. Much of humanity will soon be doing the same. Problem is, how will they feed themselves, with the river flats and coastal plains suffering salt intrusion and inundation? This wasn’t the motivation in the first place, though ..